Do you ever feel like a fraud? Like you got your job out of good luck or fluke, and someone might realise at any moment and send you packing? Do you ever look at your superiors and feel you could never compare? If you recognise the sound of this niggling professional self-doubt, you’re not alone. It’s known as Imposter Syndrome to those in the know, and it affects more women than men. We want to know why. We've lost count of the number of WISP contributors have mentioned feelings such as these. Loads more have talked about their professional desires when answering our mirror question... It seems that our amibitions are a fundamental part of how we see ourselves. So we decided to follow our first monthly discussion – Motherhood – with one on the thing that makes its mark on every single woman. Ambition. Whether you consider yourself ambitious or resolutely not ambitious at all, whether you’re a career-orientated businesswoman or a stay-at-home mum, whether you’re a student or a pensioner, ambition affects everyone. If you’re a veteran of Impostor Syndrome or if you’re cool, calm and confident to your core, we want to hear what you think about ambition. For our contributor Kimberley Wilson, a psychologist who you may recognise from the flour coated pastel colours of the Great British Bake Off tent, showing confidence and ambition was something that provoked the criticism of the Twittosphere. 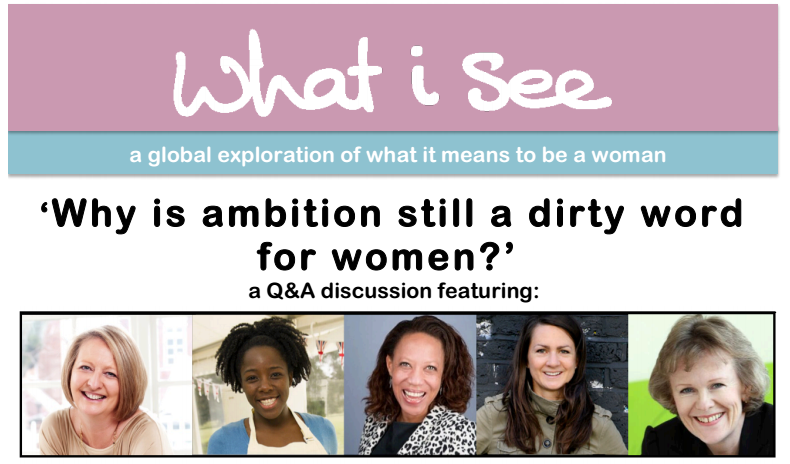 She joined in with our Twitter chat on the women and confidence, and now she’s going to help us explore whether ambition is still a dirty word for women at a live panel discussion in collaboration with the fabulous LSE student union, on 12th February. Kimberley will be joined by Jenny Garrett, sought after executive coach and author of Rocking Your Role; Polly Courtney, who chucked in a City job in favour of a super successful writing career; and Rowena Ironside, Chair of Women on Boards UK. Our founder Edwina Dunn, the entrepreneur behind Tesco’s Clubcard, will be chairing the discussion. We can’t think of anyone more suited to talk about women’s relationship with ambition today – except you. If you can make it to LSE next Wednesday, send an email to hello@whatiseeproject.com to reserve your place and submit your questions to the panel. That’s not it. We’ll be publishing great guest pieces from more amazing women throughout the month, including a debate on what’s holding women back. It’s all for you: get involved by commenting on the blog and joining in our weekly Twitter chats, Fridays at 2pm GMT using the #WISPchat hashtag. Because it’s time to talk about the issues that matter to you.